Wand up! 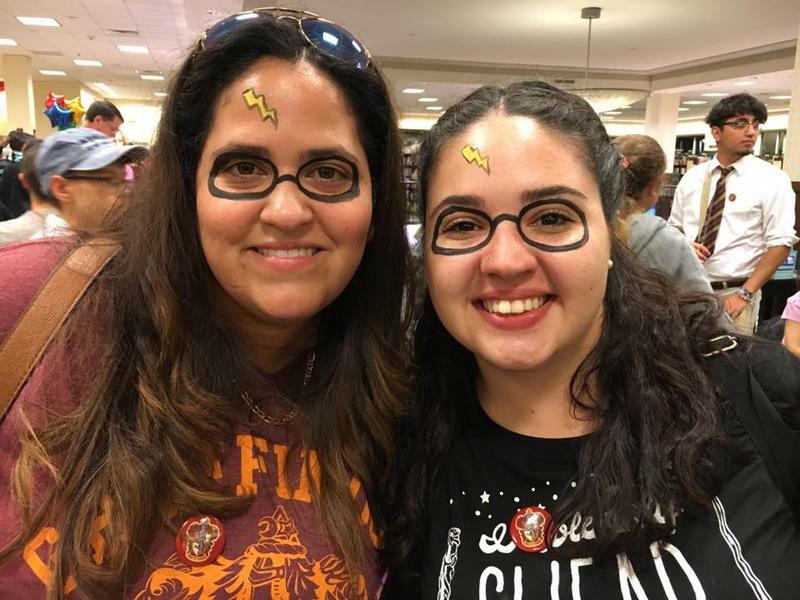 South Florida Muggles and aspiring wizards gathered for the countdown to the new installment in the Harry Potter saga. 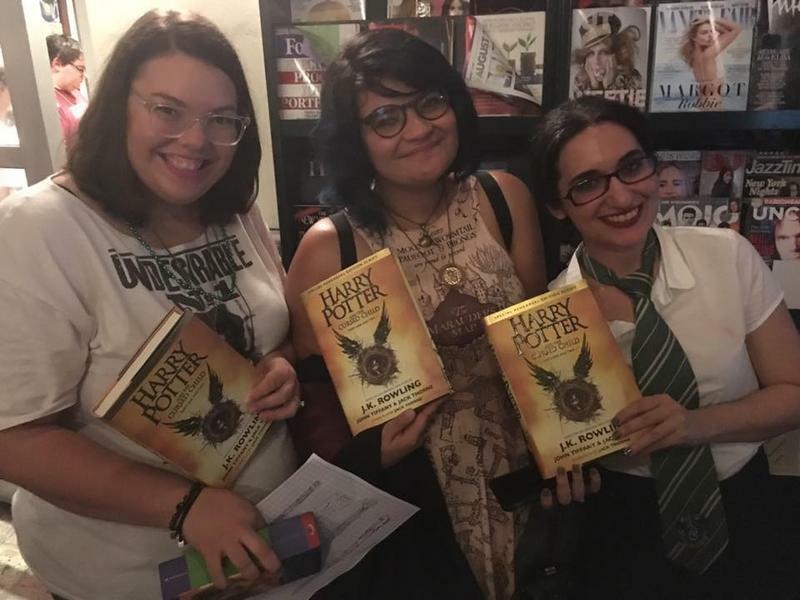 Elsie Alarcon, Juliana Failde and Nabila Nassar with their brand new Harry Potter and the Cursed Child books. Margie and Alexis at the #HarryPotter release party at Barnes and Noble in Fort Lauderdale. If you tried calling the main public library in Downtown Miami Saturday night, instead of a regular greeting you heard: “Hogwarts Library, Dumbledore speaking”. That’s because the library transformed for the release of JK Rowling’s newest book - a script for the play called “Harry Potter and the Cursed Child.” And they were not alone: bookstores and libraries around South Florida celebrated with parties, contests and crafts the arrival of the 8th installment in the saga of the orphan wizard boy. By 9 p.m. Saturday, the Miami-Dade Main Library estimated that nearly a thousand people had come to the release party - nine years after the last Harry Potter series book was released. The library went all out for the occasion, decorating its rooms with Harry Potter themes and offering magical crafts, trivia and even the chance to meet Hera and Emrys, cousins of the Harry Potter's famous message owl, Hedwig. When asked, what’s the South Florida equivalent of butterbeer, the sweet creamy beverage that Harry Potter drinks, Wolverton’s friend Randy Darbro says it would have to be something touristy.“Probably something with key lime in it, probably, I don’t know, maybe oranges? More Muggles - Potter-speak for humans- were seen in parties in Barnes and Noble bookstores in Sunset, Fort Lauderdale, Palm Beach, Plantation and other locations in South Florida. 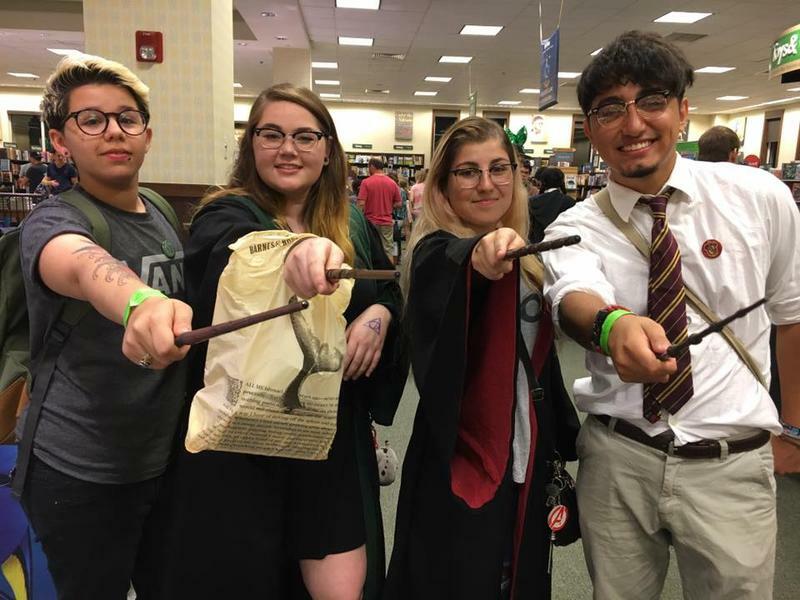 Parties at Barnes and Noble locations included trivia and costume contests as well as sorting hat ceremonies, a tradition at Hogwarts, the magical school that wizard Harry Potter attended. In Coral Gables, more than 300 people joined the countdown celebration at Books & Books waiting for the sale of the book, scheduled to start at 12:01 am on Sunday. This is was the 7th time that the store organized a party of this kind for a Harry Potter book. "We have hosted a party for just about every one [of the Harry Potter books] except for the first one, when nobody knew how much of a success this was going to be," said Mitchell Kaplan, owner of Books & Books. "They all had the same spirit that you see tonight: people enjoying themselves." Kaplan did point out how much the Harry Potter audience has changed over the years: "The main difference is that you now have Millenials reading this books because they grew up with Harry Potter (...) And then you have older people who read all of the Harry Potter books and are now in the 20 -some of them in their 30s- and they are getting the new one because they remember the books form when they were kids themselves." All of the rooms at the Books & Books store in Coral Gables were decorated with themes of the books, including the children's section, which was transformed into "The Chamber of Secrets". There was also a Muggle wall for people to share what the Harry Potter books meant for them, as well as a magician playing music in the courtyard and a popular game of trivia. In a sign of the changing demographics of the series, volunteers circulated among the crowd offering forms to register to vote in the upcoming elections. At 11:50 pm, the revelers started to form in line to get their books. All of participants at Books & Books had bought their copies in advance, so at 12:01 am the staff started to hand them out to a happy crowd. You can see pictures from Harry Potter Countdown parties along South Florida in our Facebook album. Happy reading!